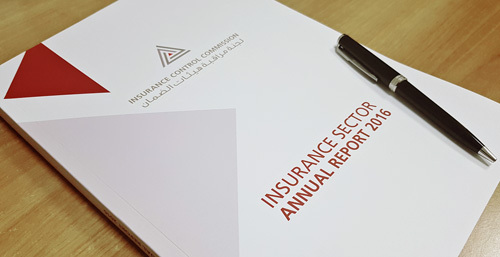 The Insurance Control Commission published the annual report for the insurance sector for the financial year 2016. The report exhibits a large number of financial and technical statistics, indicators, and analytics, which the ICC makes available to a large number of stakeholders, including experts, financial analysts, shareholders, and policyholders. In his editorial prefacing the annual report of the Insurance Control Commission, HE Mr Raed Khoury, Minister of Economy and Trade, heralded the resilience of the national economy in the face of unprecedented challenges, stemming primarily from the crisis of the Syrian refugees who exceed the third of the local population, and its impact on the infrastructure and the labour market. HE stated that the positive political environment has tremendous potential to combat the most pressing issues. Mr Khoury highlighted the positive role being played by the Insurance Control Commission through its independent supervisory mission, and to the commencement of the implementation of the memorandum of understanding with the Capital Market Authority, which should reinforce the supervision on the financial instruments included in life insurance products. He encouraged the insurance companies to earnestly consider merger operations that can result in larger insurance companies capable of pushing the level of the industry to better standards and invest in its development. He highlighted that the Insurance Control Commission will focus in the coming period on organising a number of considerations related to the medical and motor third party liability insurance lines, as these topics form an important pillar of the sector while being of utmost importance for the Lebanese citizens. In parallel, the interim President of the Insurance Control Commission Mrs Nadine El Habbal pointed to the extent of growth potential still residing in the national economy for the insurance products in a number of sectors such as medical, household, and old-age insurance. She stated that the penetration rate of insurance premiums is below the averages observed in developed markets as it hovers around 3% in Lebanon as compared for example with an average of 9% in OECD countries, reflecting the underinsurance at the level of the population. Mrs El Habbal pointed out the large horizons emanating from the new digital technology and artificial intelligence methods with important applications to the insurance industry. She also described the main achievements of the Commission which aimed particularly to the protection of the interests of the policyholders through the control and inspection of infractions at different levels. She mentioned especially the establishment and launching of ICC Care which aims to receiving the complaints of policyholders and finding ways to resolve them. On a strategic front, Mrs El Habbal stated that the Commission adopted a Risk-Based Supervision (RBS) approach which will be implemented in parallel with a reinforcement of governance and the implementation of a risk-based capital (RBC) model to quantify the solvency of the insurance companies.